Powerful magnets, quick release and improved adjustable wheel brackets make the best magnet around even better. 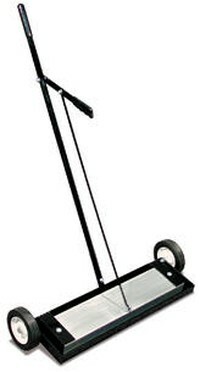 Comes with 7" diameter wheels and a stainless steel magnetic box for easy clean up. The 30" long handle fols up for storage. Easy to use Push Magnet features stainless steel face plates. Deep permanent magnetic field never need recharging. 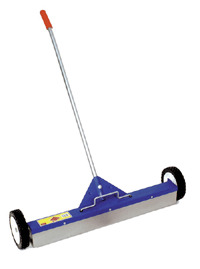 Features a 30" long steel handle with an easy to use release lever.